Fresh production marks 60 years of violinist Yu Lina's dedication to her craft, Zhang Kun reports in Shanghai. The project, which was announced in Shanghai on March 26, will premiere in Shanghai in November before moving to Ningbo, Zhejiang province, and then onto Beijing. The new production can be seen as a testament to Yu Lina's dedication to her craft. Sixty years ago, when she was assigned to learn the violin at the Shanghai Conservatory of Music, Yu was frustrated by the lack of appreciation for the instrument. "There was no applause after our performances. It was painful," recalls the 79-year-old. Determined to champion the instrument, Yu and a group of former schoolmates formed a workshop with the aim of creating violin performances with Chinese characteristics. On May 27, 1959, Yu and fellow musicians Chen Gang and He Zhanhao reaped the fruits of their labor - they premiered the violin concerto Butterfly Lovers at the Lyceum Theater in Shanghai. Yu was the violin soloist for the performance. The concerto, which features melodies and musical material from traditional Yueju Opera, is based on a story from an ancient Chinese folk tale. The piece was written in the traditional Chinese pentatonic scale, with Chinese chord structures and patterns. The concerto has been hailed as a classic ever since that day, and has been performed all around the world. Former Chinese premier Zhou Enlai invited Yu to play the piece when foreign dignitaries visited the country. The new musical will consist of four love stories. The original folktale is about a young couple who rebel against their parents after they are forbidden from seeing each other again. The lovers are eventually reunited as butterflies after their death. The other three stories are based on real-life events. 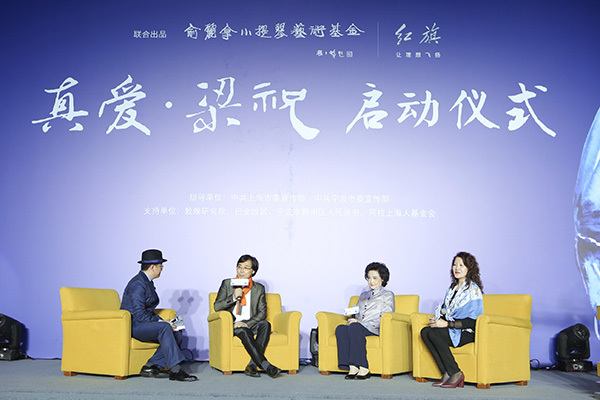 In the first tale, Fan Jinshi and her husband Peng Jinzhang are separated for 19 years because of Fan's work at the Dunhuang Academy in Gansu province, which revolves around the protection of the frescos in the Mogao Grottoes. Wang Yabin, a dancer, will play the role of Fan. "A lot of the frescos in Dunhuang feature scenes of dancing," Wang says. "They have provided great inspiration, and with the help of video projection, I believe we can tell this story of enduring love through our dance movements." The second story features Ba Jin (1904-2005), one of the most prominent Chinese writers of the 20th century, and his wife Xiao Shan. Despite having to endure hardship and numerous other problems after getting married in 1944, Ba Jin and Xiao always remained true to one another through their lives. The strength of their love was illustrated by how Ba Jin kept his wife's ashes on top of a cabinet in his bedroom since her death in 1972. "After his death, their ashes were mixed and scattered in the East China Sea," says Zhou Limin, the executive director of the Ba Jin Memorial Hall in Shanghai. Film and television actor Wang Zhifei will play the role of Ba Jin, while his wife Zhang Dinghan will play Xiao Shan. Wang says he would carefully read the correspondence between Ba Jin and his wife to prepare himself for the role. The last story is about Princess Wencheng (628-680), who was sent by the Tang emperor to marry the Tibetan King Songtsen Gampo to forge an alliance. Liao Changyong, an operatic baritone, who is also head of the Shanghai Conservatory of Music, will play the role of the Tibetan king.